I've never been athletic. I was the girl that no one picks for their sports team at school - bad memories. The idea that I could enjoy any sport came to me very late. I started with some gym, later yoga, and, eventually, I started running. Running, me? It seems so out of character for people who have known me since I was a child that many didn't believe me when I shared the news on Facebook: I was training for my first 5K race. Like many newbie runners, I tried to do too much, too soon and a poorly designed training program paired with my newly discovered competitive spirit ended in an all too common runner's nightmare: knee pain. It got bad enough that I had to stop running and ended up at the doctor's office, where I was diagnosed with pes anserine bursitis. To make it short, a little sack that produces lubricant for the joint was swollen and inflamed, pushing the nerves and tendons around, and causing pain in the area. I started physical therapy, but I needed something to manage the pain. I'm not much of a pill popper, and I didn't feel like NSAIDs such as Advil were helping much, so I turned to topical analgesics. They're gels, creams or sprays that you apply to skin to relieve local pain. There are a bunch of different options containing different ingredients, one of the most common being menthol. This is the active ingredient in OxyRub Pain Relief Cream. The way menthol works is kind of interesting: it basically interferes with the pain signal traveling to your brain by distracting it with another sensation, cold. Menthol triggers the nervous receptors that detect cold, causing a cooling feeling, and thankfully our nervous system is not too good at multi-tasking when 2 signals are generated in the same area of the body. The mode of action of menthol being basically a brain trick, it can't do anything to treat the cause of the pain. It can't heal your injury, but by providing fast relief, it's very useful in a pain management strategy. OxyRub was formulated by Dr Pergolizzi, presented as "Expert in Pain Medicine" and its suggested uses include sore muscles, back pain, joint pain, arthritis. Besides menthol, it contains what the brand calls a blend of emollient and oxygenated essential oils, supposed to make it more efficient than other brands. The ingredients include bitter orange and eucalyptus oils, which give this cream a sweeter scent than other topical analgesics I've tried, with a fruity note, although menthol still dominates. - if I apply this in bed without washing my hands afterwards, I won't wake up in the middle of the night with an eye burning like hell because I scratched it in my sleep. Yep that happened to me with other menthol rubs! I also like that this rub comes in a cream form, rather than a gel or spray, because it allows me to massage the painful area. It does absorb fast without leaving any greasy residue, but if I use a good amount, I have a few minutes to massage it in and I feel like it helps. I've had the best results in terms of pain relief by applying it on a larger area (all over my knee rather than just the precise point that hurts) and massaging until the cream has been absorbed. The cool feeling is pleasant, no tingling or brutal icy sensation, and it lasts for a while. 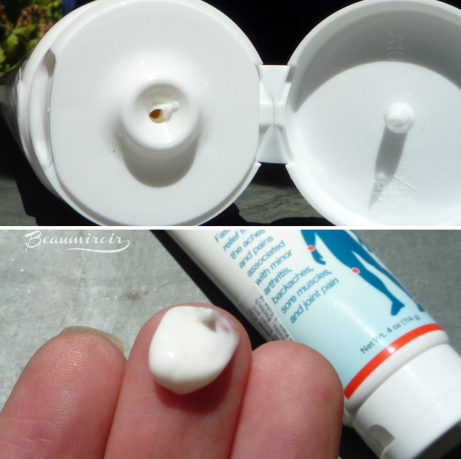 Oxyrub comes in a classic squeeze tube, but it has a flip-top lid rather than a screw-on cap. It's easy to open, and that's important considering the product is also meant to be used by people who suffer from arthritis in their hands. 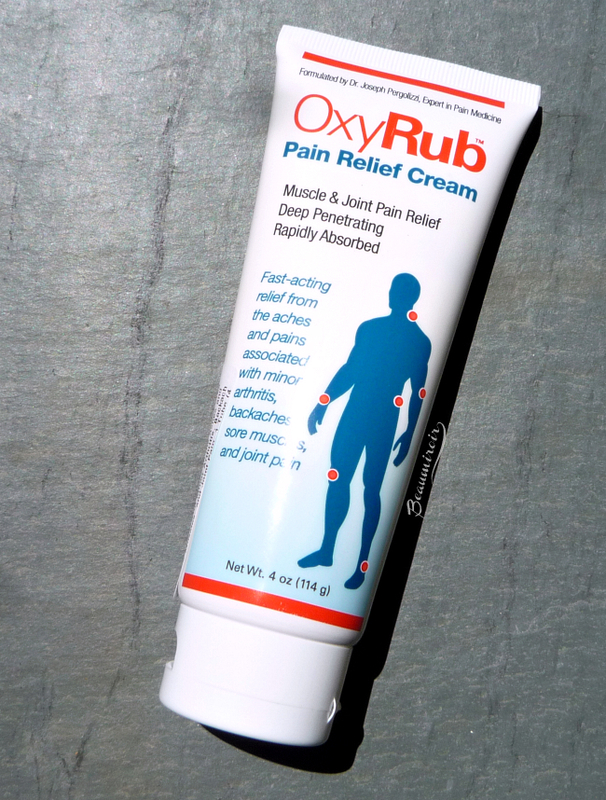 Overall: OxyRub is a good way to relieve minor pains due to sports activities. It provides some fast relief without the side-effects related to pain killer. For runners, it's a good option to deal with joint pain and muscle soreness, as it offers an alternative to the RICE method (rest-ice-compress-elevate) and is more appropriate for minor chronic pain and post-run soreness. It can help decrease your consumption of Advil and the like, and that's good news for your health! Beaumiroir readers get a 20% discount, valid until 12/31/15, with code SAVEOXY2 ! The product featured in this review was provided by the brand through Brandbacker for review. I received no compensation other than a free sample to write this post, which only reflects my personal opinion. This post contains affiliate links. Something like that would probably be very helpful when you restart! It also has menthol kind of smell. It's also the same idea as Tiger balm, that I used in France. Menthol balms have been used for pain for a long time, I think that they do help!